Porcupines are mostly nocturnal, spending their evenings foraging for dinner. They tend to mind their own business, getting their dander -- and their quills -- up only when threatened. Would-be predators are wise to beware, as getting too close to a "quill pig" can result in a snout full of needles. 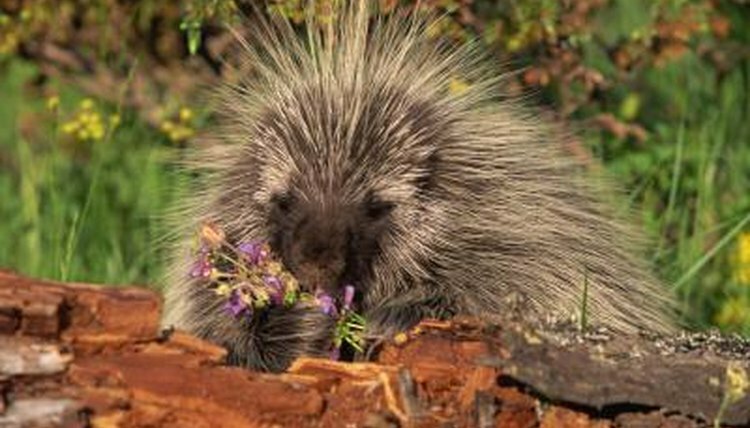 Though porcupines will eat bugs once in a great while, they're mainly herbivores, so they tend to stick to roots, berries, springtime buds and fruit. Much of their diet is driven by where he calls home. Porcupines in rural areas sometimes annoy farmers by raiding crops and feasting on potatoes, melons and pumpkins. Porcupines will occasionally dine on a lizard or insect. Porcupines are arboreal, built for climbing trees. Their prehensile tails make the task of living in the trees easier. Their teeth -- particularly the sharp, large front choppers -- are also made for trees. Porcupines have a good appetite for wood and make meals of bark they strip from trees. In fact, the North American porcupine has made a few people prickly because his bark-stripping ways kill timber and ornamental trees. The season will impact what and how much a porcupine eats. In the summer, the protein choices are more abundant, so they eat less and tend to focus on the season's bounty. In the winter months, trees are important food sources, providing pine needles and the bark they enjoy so much. Porcupines will gnaw on found bones, but it's basically for the fine job bones do of sharpening their teeth and getting a little extra salt in their diet. Though bugs are likely plentiful in the forested areas they often call home, they're not at the top of the menu for porcupines.